Can't make a decision? Spin this humorous, aluminum paperweight to have your challenging questions answered. Let this clever device ease the burden of having to make so many decisions in your life. Balancing all the pros and cons of every call can be tiresome, and we never know all the possible pros and cons anyway, so why not give someone else the responsibility of deciding? Spin this gorgeous aluminum paperweight to have your questions answered - or should you "sit on it" for a bit first, or "pass the buck" to someone else? Made in China. This is a fun product but it also has a practical use as a paperweight. Well made. I bought this for my boyfriends new cubicle. He has already gotten multiple comments on it and he absolutely loves it. It's unique enough to add character but not too unique where it's distracting. Very high quality product, too! Good quality. Small desk footprint. Always worth a laugh. Great for a office gift exchange. 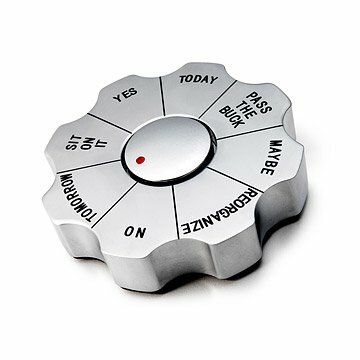 It's primary use is a paperweight but also in a corporate environment when things are moving fast, and sometimes you just need a random decision maker to help you move on, this seriously does come in handy. Went to a company party before Christmas weekend. I used it for the white elephant gift exchange. Management themselves cracked a joke about how it was perfect for them! This was the perfect gift for my boss! It is very sturdy and well made. Perfect Toy for a 27 year old "Big Kid"
Our 27 year-old Grandson was truly delighted with the "toy" for his desk. It was really a fun gift to give and way more interesting than sox or a sweater! A beautiful product that is modern enough in design that it will fit many deco styles. That this product is also helpful for those needing to make decisions often--which is why I bought it--is also evidence of its versatility.